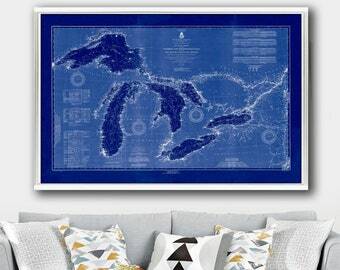 Great Lakes nautical map, Vintage 1916 Great Lakes nautical map/chart reprint - 3 color choices&6 sizes up to 72"x48 "
1902 Pittsburgh panorama, Vintage Pittsburgh map home decor reprint - 4 large/XL sizes up to 54" x 36"
Announcement Etsy shoppers! We truly appreciate your business. Here are a few items of note to help ensure a smooth shopping experience with us. All of our prints are made to order. We try to print in sequence of when we receive an order. To be fair to all customers, we do not honor requests to bump up an order. To avoid any shipping delays or mis-delivery, please check the shipping address prior to finalizing your order. If you need to change the shipping address and cannot do so prior to paying, please send us a convo/message here at Etsy as soon as you can. Additionally, please double check the size (and color version, if applicable) of the print you are looking to buy. 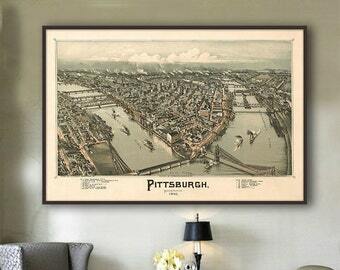 Please make sure you absolutely love the size and color/design of the digital print or map reprint that you purchase prior to completing your order. Returns and exchanges are not accepted except for *post office* damage or lost/stolen items (see our shop policies for more details). Due to the nature of map reprints and our other reprints, we prefer not to restock prints that have already been shipped to another customer. As a courtesy to all of our buyers and to ensure quality assurance, you will always receive a brand new print and never a returned item). We do not give refunds for order arriving late because we cannot control post office delivery delays. Note: Effective 12/26/2017, we reserve the right to contact you before printing to verify the size and color (if applicable) of the print(s) you have ordered. As well as your shipping address. This is meant to help you receive exactly what you intended to order to avoid misdeliveries. Please see our shop policies page for more info. Etsy shoppers! We truly appreciate your business. Here are a few items of note to help ensure a smooth shopping experience with us. 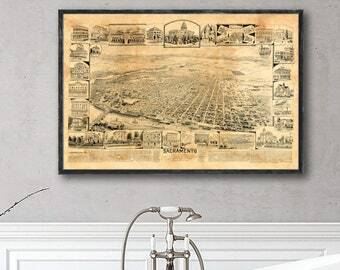 1862 Johnson's Roman Empire map reprint - St Paul's Journeys/Biblical Map - 3 colors & 4 large/XL sizes up to 54"x36"
1860 New England map reprint, vintage Colton New England map reprint - 3 color choices & 4 large/XL sizes up to 36x48"
Arrived quickly and the gift recipient loved it! I love it!! It looks beautiful framed and the paper is great quality. It shipped fast, I had no issues with the seller. I would definitely purchase again. Framed it myself and now it looks really nice in my office. We own a few hundred old Atlas maps. This is the 1870 Johnson's Boston map along with a test reprint. With our map reprints, we scan and retouch. We try to improve on the original while keeping its charm. This 1915 Los Angeles map reprint is drying and waiting to be mailed. We use an Epson P8000 for our map reprints. 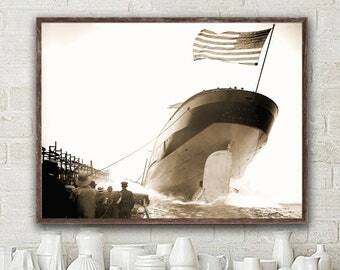 Recently, the Lakewood Library (Ohio) exhibited 20 of our favorite reprints. We're Xiaojing and Justin and we've been living in the Cleveland suburbs over 9 years. 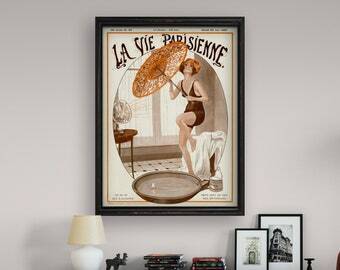 Since 2013, we've been selling our graphic design prints on our other store, 8RedFishCreative. 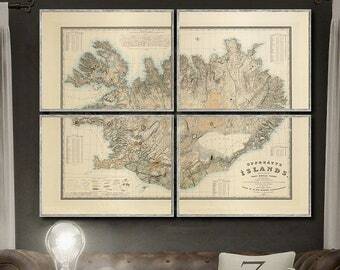 But we like maps and other old vintage prints and we've amassed a fairly good-sized collection of them. In fact we own two editions of Johnson's Family Atlases - 1862 and 1870 to exact. 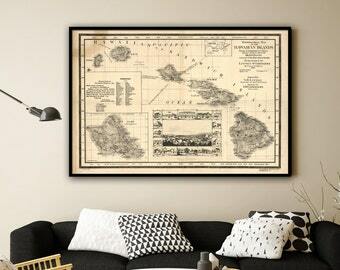 Now we would like to share our passion with others in the form of map reprints and reprints of other old prints. A Denver native, Cleveland transplant. Office wonk by day, Etsy shop owner by night. 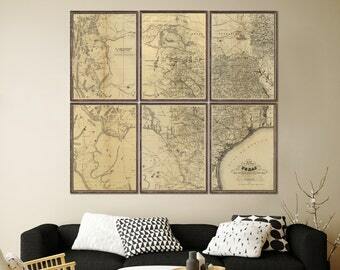 I love old maps, and like the whole retro/vintage design movement. I started 8 Red Fish Creative with my wife, Xiaojing, in 2013. Born in Hubei, China and living in Cleveland area. I like taking photos of nature, flowers, and old buildings. My husband and I started 8 Red Fish Creative in 2013. Welcome! 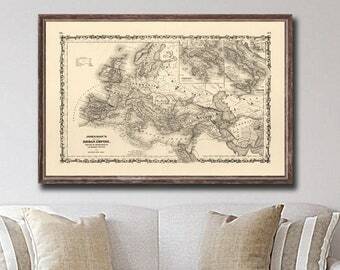 We offer reprints of old maps and other vintage reprints. We are a husband-and-wife team based in the Cleveland, Ohio area. Please review our shop policies regarding cancellations, replacements due to Post Office damage, lost items, etc. Please make sure you absolutely love the size and color/design of the digital print or map reprint that you purchase. Returns and exchanges are not accepted except for post office damage/lost/stolen items (see below for more details). Due to the nature of map reprints and our other reprints, we prefer not to restock prints that have already been shipped to another customer. As a courtesy to all of our buyers and to ensure quality assurance, you will always receive a brand new print and never a returned item). Note: Effective 12/26/2017, we reserve the right to contact you before printing to verify the size and color (if applicable) of the print(s) you have ordered. This is meant you receive exactly what you intended to order. Cancellations (for a full refund) are accepted, long as they requested and are made prior to us printing. If you need to cancel all or part of an order please contact us within 4 hours of placing your order. 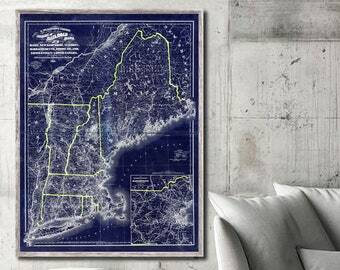 UPDATED 10.21.2016: If you are looking to order one of our large vintage map reprints (and other prints 18x24/30x20 or larger), please measure your wall before ordering. Due to the amount and cost of archival ink, cost of paper, and the special handling in trimming and packaging of the prints, we can no longer offer exchanges for the wrong size or wrong color chosen. Items that have arrived damaged due to the Post Office (very, very rare, but it can happen): Please let us know as soon as possible. Please also attach a photo of the damaged print. We will make arraignments to replace your print. No refunds are given for digital downloads (e.g., calendars) or for personalized/custom orders. Update 1/10/2016: We will no longer give refunds for items that arrived late due to the Post Office taking longer than expected. We have noticed orders going to the Houston area and the southern areas of California have been taking longer than what the Post Office has listed as the expected date of delivery. This includes orders going via priority mail shipping. These delays are beyond our control. If you are ordering this as a gift for someone else and looking for it to be delivered by a certain date, please factor that into your time frame, especially if you live in one of the areas noted above. If you think your order is lost in the mail, please first check the tracking details. If the package is listed as "in transit", the tracking information should indicate an expected delivery date. If the tracking information indicates the package has delivered but you have not received it, contact us as soon as possible. Please, let us know if the package is lost. We will do our best with USPS by filing a "lost mail report" and get your order to your hands one way or another. However, we also recommend going to your local post office to inquire. We've found when we've had customers do this, orders almost always appear the very next day! Plus, check around other parts of your residence - some postal carriers can and have been known to put a package within the screen door of a side entrance or in the bushes. If need be, you should also open an official case with USPS. The postal service does take mail theft seriously. While they do that, let us know what is happening so we can send a replacement order if need be. Ohio purchases are subject to a 8% sales tax since we are based in Cuyahoga county. Trades are not accepted. Most orders are shipped within 3-5 business days. If it is a local (Cleveland, Ohio) area order, please send a convo first before placing the order. If the distance is not too far, we might be able to arrange a direct delivery rather than mail it. If so, we can do a custom listing with no shipping charges. 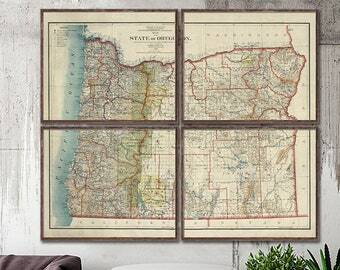 DOMESTIC customers: Most orders (18x24 and larger) are shipped within 3-5 business days in a heavy-duty shipping tubes via USPS priority mail so you don't need to wait long. 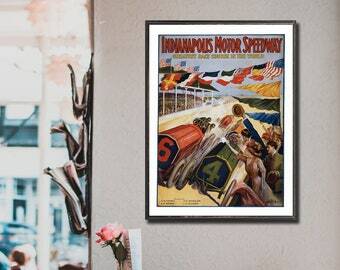 16x20 prints are mailed in shipping tubes, but comes with standard shipping (which can be upgraded at checkout.) Smaller sizes are shipped in a flat document mailer with stiff chipboard to keep your print flat and protected. INTERNATIONAL: For big map reprints/extra-large-sized reprints...Please send us a convo for more info on a quote for a custom/private listing with shipping charges based on your location and the size of the map reprint you are looking to buy. TRACKING INFO for US orders will be sent to you once your item is shipped and includes a link to check the status of the shipment. Once we start shipping internationally, not all countries offer tracking. For gift receipts/gift messages: Let us know in the notes when checking out and we will leave the price out off the gift receipt for our print orders. Any gift messages are printed on the gift receipt. Colors: All monitors display colors a little differently. The actual color of your item may vary a bit from what you see on your screen. We do strive to make sure the print matches what our Apple's monitor shows.